OK...You know when you pass someplace so often that you don't really notice it's there? This happens to me more often then I'd like, particularly when it's someplace with decent BBQ. I frequently ride my bike along the W&OD trail in Northern VA. This is an old railroad right of way turned into a park for walkers, cyclists, and any non-motorized vehicles. Along the way are a number of places to stop, some run by restaurants selling refreshments. 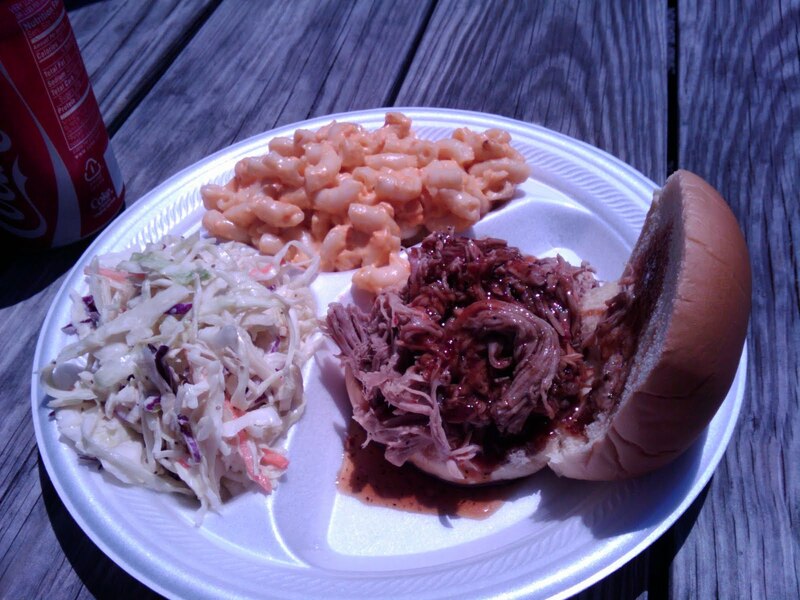 One of these, Carolina Brothers BBQ in Ashburn, sells cold drinks & other stuff, and sometimes I stop. Well, today I came by during lunch, and I was hungry. I got even hungrier when I could smell the smokers out front. Cole slaw - fairly tasteless. Slaw is either vinegar based or mayo based. This seemed to have neither. Pork sandwich - wow! quite good, almost ordered another. It was juicy but not wet or undercooked. Full of flavor, particularly when paired with the sauce that was first rate. The place was very clean, not fancy. It looked and smelled like a BBQ joint. I have only one complaint: This is NOT pit Barbecue, despite the sign on the door. Pit requires earth, as in a hole in the ground. The result is very different from what comes out of a steel smoker. Still, good Q.